Fresh pasta is the best. And making it on your own you will help reduce your use of plastic! This bread maker dough can be made into any shape of your choosing. 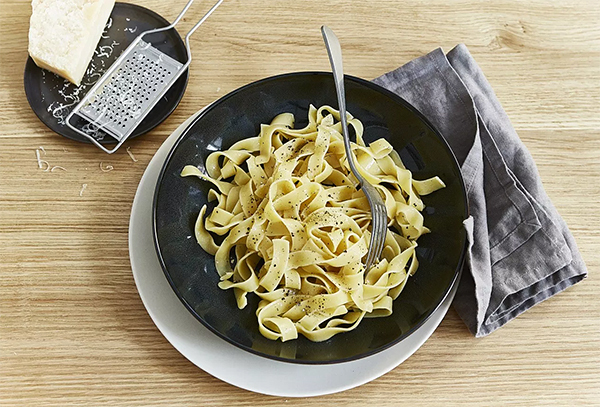 This recipe shows you how to create the dough and tagliatelle. You can use this pasta alongside many of our other pasta sauce recipes. So give it a go and see how many recipes you can create! Remove the baking tin from the machine with a clockwise rotating movement. Insert the dough hook in the tin. Add the flour, semolina and eggs. Place the baking tin back in the bread maker and close the lid. Select program 3 from the menu and start the device (made using our SD-ZB2512 bread maker). After 20 minutes, once the device has beeped 8 times to signal that the program has finished, open the lid and remove the baking tin. Place the dough on a work surface that has been dusted with flour. Knead until it forms a smooth dough. Wrap in cling film and beat, then leave to rest at room temperature for 1-2 hours. Press the dough out flat using your hands and roll out thinly using a pasta machine up on a thin ish setting. Cut with the pasta machine’s tagliatelle cutter. Dust the fresh pasta with a little bit of flour to prevent it from sticking together. Bring a large pan of water to the boil, add salt and cook the pasta for approx. 3 minutes until al dente. Made using our SD-ZB2512 bread maker: http://bit.ly/ZB2512-Bread-Maker.